Meet Louisiana Ladies unafraid of loving outside-of-the-box! They are smart, sassy, spunky and on the other side of thirty! Love doesn't disappear at forty. It flourishes! Cutie and the Cowboy Trucker - AA/Sensual - Bookstrand Daily Bestseller Coming September 12, 2012 - Pre-Order now at reduced price until September 19, 2012! Widow Veronica Torres needs something desperately—invisibility. A rash decision puts her on the road and right into the path of trucker Mike Masterson. Will he be just another speed bump in her life? Or will Mike's compassionate ways make all of Veronica's troubles disappear? How many things can go wrong at one time? That question plagues feisty divorcée Sharlene Mouton. A lost job. 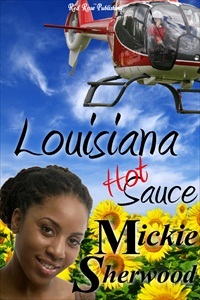 An oil spill ecological disaster threatening her rural Louisiana community. What else can happen? How about repeated run-ins with suave Drake Cormier, the oil company’s liaison officer, and someone barely older than her daughters. A Hawaiian escape is just what runaway K.C. Montreaux needs to mend her broken heart. Not the lies and deceit of her self-appointed rescuer. But—that’s not all Dr. Nick Hart supplies her. Reclusive Mesha Rayburn’s horrible secret keeps her shattered heart under lock and key. Can helicopter mechanic Jack Connolly break in to make the necessary repairs? Thanks for the blurbs! Very tempting...great covers, too. I checked you out, too, Laurel. Sounds like love renewed to me. Four great books! The Louisiana setting really appeals to me. I'll add those to my TBR list. Louisiana settings can be the backdrop for a variety of different genres. The influx of movies being made here speaks to that. Thanks for stopping by, Sandy.